Elevated to the very pinnacle on the Men’s World Rankings, China’s Fan Zhendong is the top seed at the forthcoming Lion 31st ITTF-ATTU Asian Cup Yokohama 2018; play commences on Friday 6th April. The task in the Japanese city is principally threefold; to climb one step higher than last September in the Indian metropolis of Ahmedabad when he finished in runners up spot, to qualify for the Liebherr Men’s World Cup to be held later in the year in Paris and thus attempt to regain the title won in 2016 in Saarbrücken, thirdly to win the Asian title for the first time. In Ahmedabad, Fan Zhenzhong was beaten in the final by colleague, Lin Gaoyuan; thus reversing the decision of the 2012 World Junior Championships, also staged in India in Hyderabad, on that occasion Fan Zhendong had prevailed in the Boys’ Singles final. The defeat in Ahmedabad also denied Fan Zhendong the opportunity to defend his World Cup title; only two players per national association eligible, Lin Gaoyuan gained a place as the Asian Cup winner, Ma Long as the reigning World champion. Now in 2018 it is the same scenario; if Fan Zhendong is to qualify for the Liebherr Men’s World Cup to be held later in the year in Paris, to guarantee participation he must overcome the second place Asian Cup hoodoo. Notably he was the runner up in 2014 in Wuhan beaten by Ma Long in the final, the following year in Jaipur it was the same outcome; in the title decider, he lost to Xu Xin. The Asian Cup title remains elusive but let’s not forget, even though he seems to have been around for a long time, he is only 21 years old; in fact if so minded he is still young enough to compete in that age group category. Seeking revenge, for Lin Gaoyuan it is seeking a repeat and aiming to dispel the doubts over his mental strength; the talent is without question but defeats last year when holding substantial leads in the decisive seventh game against colleague Xu Xin at the Liebherr 2017 World Championships and later in the year at the Liebherr 2017 Men’s World Cup, when facing Germany’s Timo Boll, pose serious questions. Equally earlier this year, at the semi-final stage of the Men’s Singles event at the Seamaster 2018 ITTF World Tour Platinum Qatar Open, he was beaten by Brazil’s Hugo Calderano. Great credit must go to the young man from Rio de Janeiro for a fine performance but did we not expect better from Lin Gaoyuan than a four straight games defeat? Lin Gaoyuan is the no.2 seed in Yokohama followed by Hong Kong’s Wong Chun Ting and Korea’s Lee Sangsu; last year in Ahmedabad Wong Chun Ting, having been a bronze medallist one year earlier in Dubai, endured a torrid time. He departed in the opening phase without winning a single match. Conversely, Lee Sangsu finished on the third step of the podium. 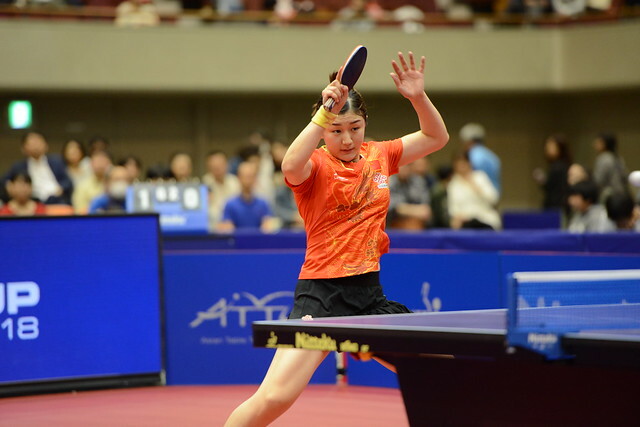 Next in line to Lee Sangsu is the host nation’s challenge with Koki Niwa and Tomokazu Harimoto on duty, the latter on debut; Chinese Taipei’s Chuang Chih-Yuan and Jeoung Youngsik, like Lee Sangsu from Korea, complete the top eight names. Chuang Chih-Yuan alongside Hong Kong’s Jiang Tianyi, the no.11 seed, are the only remaining players on duty in Yokohama to have achieved a podium finish in the Men’s Singles event at an Asian Cup tournament. Both have been bronze medallists; Jiang Tianyi in 2012 in Guangzhou, Chuang Chih-Yuan one year later in Hong Kong.